With the narrow cross court it’s unlikely that you will make an error and it’s possible that you will hit an outright winner. This shot was taught to me by Derek Lawrence (the head coach at Bremen Squash Club where I have gone out to train during the last two summers) and although I rarely use it in squash, it has a great application to racketball. The main reason why I don’t find this an effective cross court in squash is that in order to get the angel needed to hit a winner you must hit the ball down the middle of the court making the ball easy for your opponent to volley. With the heaver racketball the volley becomes very difficult to control which takes out the negative of the shot making the narrow cross court very effective. One of the best and most reliable ways to hit an outright winner in racketball is with a tight shot that is difficult to get off the wall. This is what you aim for with every straight drive and this shot gives you the chance to play the clinger (ball that runs right along the side wall) off the cross as well as the straight drive. This shot can be hit just like a normal cross court (where you aim for the nick) but needs to hit the front wall at a much narrower angle (closer to the striker). It’s best to hit the ball low and flat which will make it even more difficult to get the ball out in the back corners. Aim to hit the floor then the back wall and let the ball run along the side wall. If you take the ball in a normal position at the front of the court aim for the edge of the service box and if you get the angle right as shown in the diagrams bellow then from almost any position you can hit an outright winner. The shot can be played from the front or the back of the court and hopefully the photos and diagrams below should help this description make sense. As racketball rallies go on for a long time it’s important to have as many options as you can. 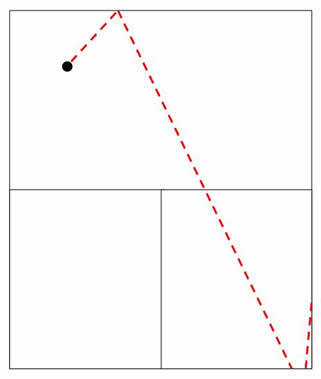 Try it out for yourself, get used to varying the width of your cross court so you can hit a wide cross court and go for the nick when you want but also have the narrow cross court to use when you are backing yourself for a winner. Hopefully this makes sense and the narrow cross court can become a useful part of your arsenal. Step 1: Notice the racket is prepared early behind my head and as I play the ball I am well balanced with my knee roughly faceing the front wall, my shoulders are facing the side wall ready to release the racket through the ball. Step 2: Must make the racket strikes the ball in front of your body to ensure maximum momentum transfer, notice that the body should stay solid as you strike the ball with only a small shoulder movment and no movement in the body. Step 3: After striking the ball try to hold your position and point the racket towards the corner of the front wall, this should help to guide the ball cross court.